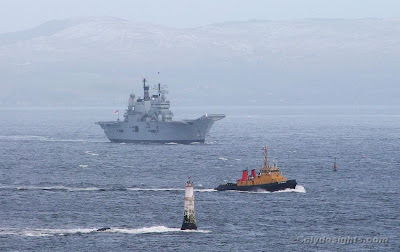 The carrier ARK ROYAL sailed from Glen Mallan this afternoon for Scapa Flow, where she will anchor for a couple of days before heading for the Tyne, where she was built in 1985. In the foreground, Serco Denholm's tug SD-NIMBLE was heading for Loch Striven, where together with other Serco Denholm tugs she was to assist in a move of the fleet auxiliary FORT GEORGE. Great picture where was it taken from? ILLUSTRIOUS arrived this morning (Monday), this picture shows ARK ROYAL sailing on Sunday afternoon. The picture was taken from the hillside behind Laudervale, a mile south of Dunoon. Defenitly HMS ARK ROYAL, you can clealy see the phalanx (white dot on the bow), HMS Illustrious arrived the next day and she does not have the phalanx, she has the goalkeepr weapon system.